KitMonsters – Roland Juno-60. The music makers’ guide to making music. 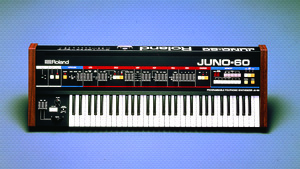 This was one of the first Juno’s and came out in 1982. It’s a six-voice polyphonic synth still popular for its punchy and rich analog sound. It has an onboard stereo chorus and three-octave arpeggiator. It has 61 keys, and 56 patches. The Human League, The Cure, Enya and Vince Clarke are well-known users, along with newer bands such as The Whip, Metronomy, Animal Collective and The Sound of Arrows.